A Mad Genius tip for chilling large-format drinks without diluting them. “The last thing you want to do at your next party,” says Food & Wine Deputy Test Kitchen Editor Justin Chapple, “is get stuck mixing drinks all night.” If you’ve spent all that time planning the party, you shouldn’t also be forced to play bartender for all your friends. His solution? 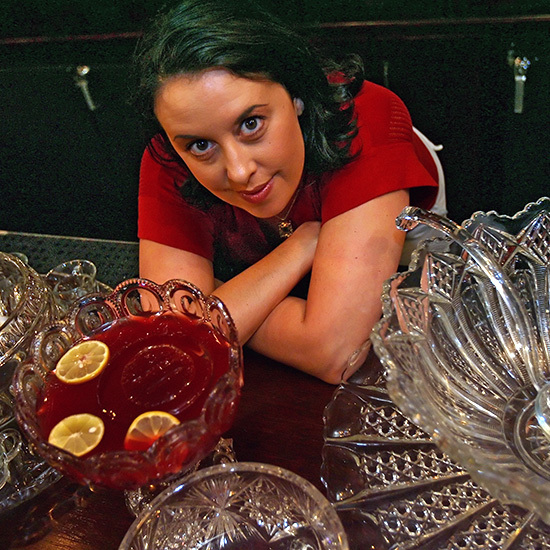 Mix up a giant bowl of punch beforehand! Large-format cocktails are huge these days (pun intended)—and they can be a secret weapon to make entertaining a lot less stressful. But how do you keep or punch or sangria cold, especially if you’re having a summer party outdoors? “You don’t want to add little ice,” says Justin, “because it’s going to melt quickly and dilute the beverage.” You want a slow melt. So, he says, you should make some large-format ice as well. To that end, our Mad Genius has perfected the art of the bundt pan ice-ring, the smartest (and prettiest) way to chill a punch bowl full. First, fill the bottom of a bundt pan with assorted fruit—Justin opts for berries, but citrus, apples or even herbs would work. Pour in just enough distilled water to cover the fruit and freeze for at least 8 hours (or overnight). To remove the ice-ring, dip the bundt pan into a bowl of warm water until it separates, and turn out carefully onto a baking sheet. The result will be an immaculate ring of colorful ice that you can slip right into your boat of sangria. Try these large-format cocktails to get the party started. And for more kitchen hacks, check out the rest of Food & Wine’s Mad Genius Tips.